Every time Paul and I are in Manila, we make sure to spend our time bonding with our families and catching up with our good friends. We're so blessed to have friends who would really take time out of their busy schedules to share a good meal with us. Take for example one of our favorite couple friends - Ro and Peter. We've known each other back in the day when Ro and I were pretty much newbies in the blogging world. Fast forward 4-5 years after and our friendship has grown from being mere blogging friends who would bump into each other casually in events to close life friends who would spend time catching up and talking about everything and anything under the sun. So when Ro and Peter invited us to join them for lunch at 'Cue Modern Barbecue, we excitedly said YES! Incidentally, 'Cue recently launched a new line of dishes which is part of their Porch Menu. Our tasting lunch consists of 4 rounds with a pair of finger foods and their specially created cocktail drinks. Oh boy, happy hour during lunch? Why not! For the First Round, we had the Patio Cooler (Php. 225) paired with 'Cue's best-selling Bone-Marrow & Steak Tacos (Php. 485) and Campfire-style Skillet of Queso Fundido (Php. 190). The Patio Cooler is a mix of Gin, Fruits, Veggies and Spices. It's admittedly a bit too strong for me as I'm not really an alcoholic drinker. 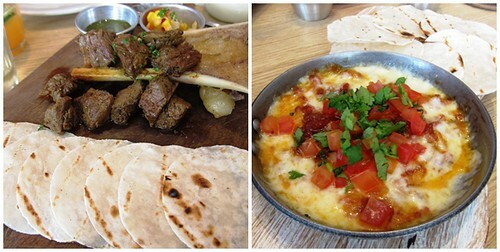 We enjoyed the Bone-Marrow & Steak Tacos which was really deadly but truly gastronomically satisfying to say the least. We loved it the first time we tried it and we love it even more on the second time. The Campfire-style Skillet Queso Fundido is perfect for all cheese lovers and for the little ones too. Served with mini flour tortillas, I enjoyed filling it with melted white cheddar, chorizo, cilantro and tomatoes. Yum! The Second Round came with the Pitmaster's Pick (Php. 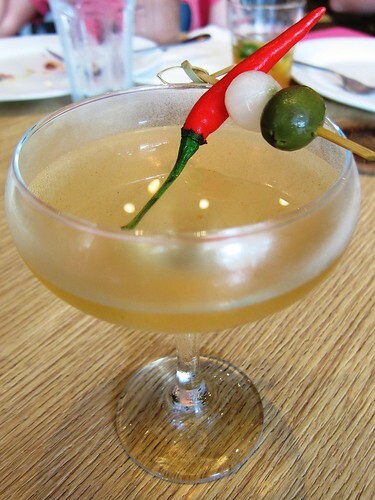 205) which is a spicy mix of Russian vodka with Filipino chili and 'Cue's house brine, olives and pickles. I've never tried anything with chili before so this is something very new to me. A bit too strong again but if you like vodka then this is worth a try! To go with this, we had a pan of Good Ol' Chicken Skin (Php 145) which was deep-fried to perfectly and served with sweet honey dip. Oh proceed with caution as it can be quite deadly and very addicting too! The Hot Pork Belly Tips (Php. 245) is an interesting finger food with dijon honey & bourbon char siu BBQ dips. Crunchy on the outside and tender pork fillet inside, I love alternating the two dips as I was trying to see which one tastes better. The verdict? It's a TIE! 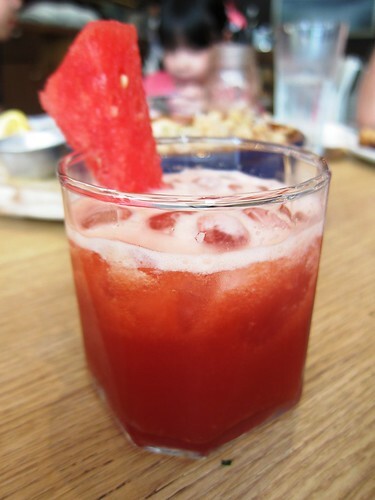 Moving on to the Third Round, we had Bonifacio Sour (Php. 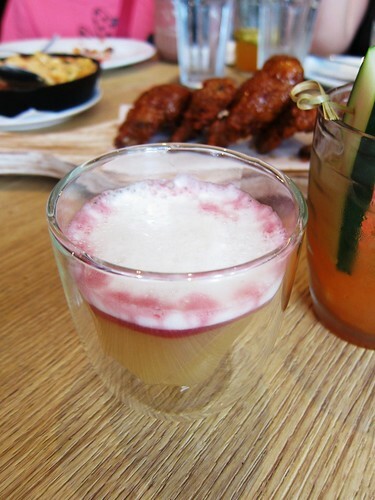 295) which was an interesting mix of Buffalo Trace Bourbon, lemon, calamansi, egg white and red wine float. I liked the sweet-citrusy flavor and the foamy top making it a nice mild drink. The best thing to pair this with are the Li'l Clams & Bacon Bits (Php. 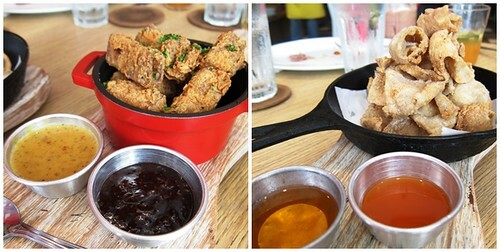 120) and the Buttermilk Wings (Php. 285). I had to skip the clams but my lunch companions enjoyed the meaty clams cooked with beer broth and torn curry leaf. We were served with bread to mop the sauce up with. The Buttermilk Wings was really yummy as I enjoyed the sweet maple-pepper glaze that perfectly coats the chicken wings. 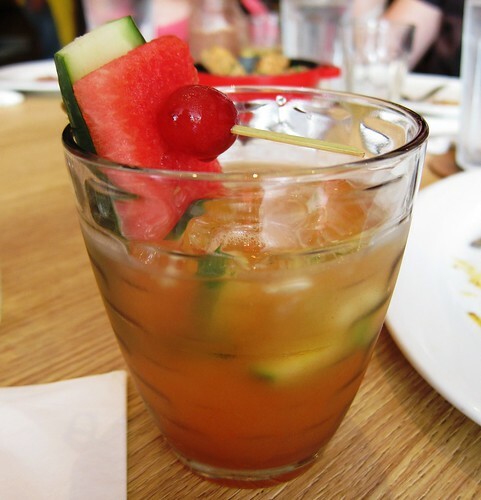 The last round has Sweet Soul Picnic (Php 225) which has Sauza Tequila Gold, fresh watermelon, cardamon-agave and fernet branca. Another fruity mix that was really delicious with a mild alcohol taste. 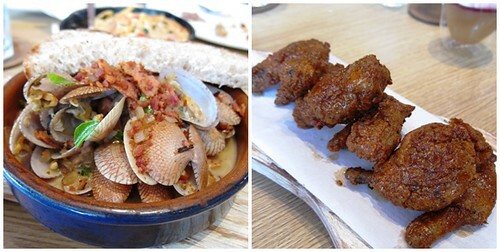 Among all the rounds, I loved the Crunchy Baby Squid (Php. 225) and the DIY Fish Tacos (Php. 245). This just got to be my favorite pairing set among all the rounds. The baby squid was served with garlic aoili sauce and spicy lemongrass vinegar dip. Yum! I would definitely order this again in my next visit. 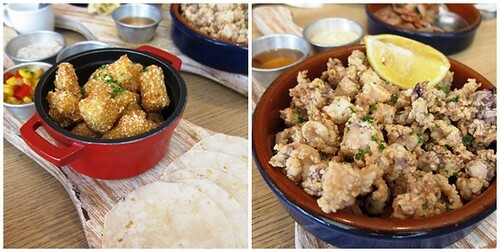 The DIY Fish Taco came with bite-sized white fish fillet that's deep-fried and coated with sesame cornmeal. The best way to enjoy this is to get a mini flour tortilla, fill it with the crunchy fish, topped it with the sweet roasted corn salsa and cilantro-lime tartar. Tadah! Even our young companions enjoyed this one too. I'm so happy that 'Cue Modern Barbecue continues to innovate and expand its menu. I can't wait to go back and to have my 'Cue favorites again. 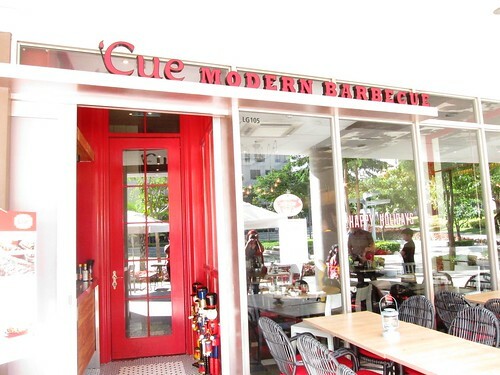 'Cue Modern Barbecue is located at the Ground Floor, Bonifacio Highstreet Central. Bonifacio Highstreet Central is located at the 7th Avenue corner 29th Street, Bonifacio Global City in Taguig City. Call them at (0917)899-2283.